Environmental Alliance, Inc. was founded in 1991 by William Smith, P.G. Prior to the incorporation of Alliance, Mr. Smith was the COO of Groundwater Technologies, Inc. Mr. Paul C. Miller, P.E. joined Alliance in 1993. Mr. Miller was a regional director for Groundwater Technologies, Inc. The two principals of Alliance account for over 60 years of experience in the environmental field. Since the inception of the firm, Alliance has grown an average of six to eight percent per year and has completed over 1,400 remediation and environmental consulting projects. Alliance has quickly grown into a mid-sized engineering and consulting firm. The simultaneous evolution of the environmental consulting industry into a few large firms and many small firms has created a niche for Alliance. That niche is comprised of a handful of regional firms who employ a diversified and experienced staff that can provide the extensive skills and expertise of a large scale environmental firm, while maintaining the relatively low overhead costs of a smaller firm dedicated to clients and projects. 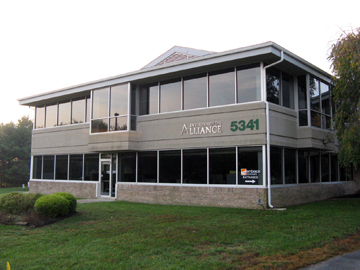 Alliance has capitalized on its position in the marketplace by entering into contracts with, and providing services for, many large industrial and petroleum companies with operations in the Mid-Atlantic and east coast regions of the country, along with several State-led and municipal contracts. Environmental Alliance, Inc. is committed to providing high-quality, responsive service to solve complex problems in environmental remediation and management. We strive to deliver efficient, cost-effective solutions that integrate client goals with regulatory compliance, using state-of-the-art technology. So what does this really mean? It means that we work to provide effective cleanup strategies to eliminate contamination from sites in order to promote human health and sustain the quality of our environment. These core principles of Alliance are driven by the nature of our business, and by our belief that customers deserve high quality, responsive, and cost-effective services. Our senior staff is intimately involved in the day-to-day operations of the business and active in the management of our key clients. They hold regular, company-wide meetings (via conference call for our satellite offices) with Alliance personnel. These sessions provide an opportunity for our collective group to discuss: company performance, trends in the environmental market, safety refreshers and reminders, and most importantly, exercises in customer correspondence and communication skills. Our customers are the “lifeblood” of our company's success, so we consistently work to provide our clients with responsive and high quality solutions for their environmental issues. There is always room for improvement.